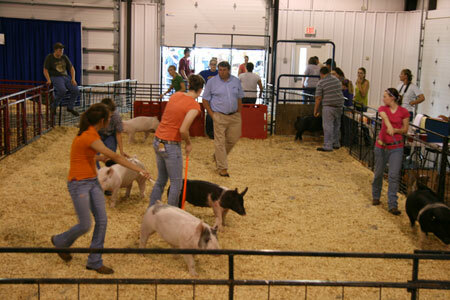 On June 4 & 5, 2011 the Livingston County 4-H & FFA Fairgrounds-Jenkins Expo Building hosted three swine shows and two lamb shows. There were approximately 380 head of hogs shown during the two-day event and 210 head of lambs. On Saturday morning, the show was sponsored by the Chillicothe FFA Alumni. There were approximately 220 head of hogs at this show. The sponsors were: AgVenture, American Family-Janet McCauslin, Bank Midwest, Barnes Baker Motors, Brammer Show Pigs, BTC Bank, Chillicothe Animal Hospital, Chillicothe Chamber of Commerce, Chillicothe State Bank, Constitution Tribune, Cooke Used Parts & Equipment, Crow Show Pigs, Davis Livestock, Farmers Electric Cooperative, Grand River Technical School, Hoffman-Reed Inc., Hutchinson & Co., J.R. Reid Show Pigs, Livingston TV & Appliance, MFA Agri-Service, Raymond Quinn Farms, Simms Show Pigs, Sullivan Show Supplies, T & R Soil Service, TLD Livestock, Trans Ova Genetics, Williams Farms, Wolf Farms, Wolf Brothers, and Young Vet Clinic. The results of the show were: Supreme Gilt went to Bailey Pope, Reserve Supreme Gilt went to Kendall Brewer, Supreme Barrow went to Greg Connell, and Reserve Supreme Barrow went to Bailey Kemp. Showmanship results were: Champion Novice Showmanship went to Cole Murphy, Reserve Novice Showmanship went to Annie Robinson, Champion Junior Showmanship went to Jarret Fuehring, Reserve Junior Showmanship went to Victoria Hinton, Champion Intermediate Showmanship went to Clay Wooldridge, Reserve Intermediate Showmanship went to Austin Boland, Champion Senior Showmanship went to Bailey Pope, and Reserve Senior Showmanship went to Jesse Birkenhotz. The two swine shows held on Sunday, June 5, 2011 were sponsored by the Missouri Youth Swine Supporters and had about 160 head of swine. The two lambs shows held on June 4, 2011 were put on by the Missouri Lamb Breeders Associations. The first show was sponsored by T & R Soil Services, Butterfield and Associates, and Purina Show Feeds.